Treat yourself to a rejuvenating and firming mask. Perfect for those of you whose skin feels less elastic and who have fine lines and wrinkles. No need to rub in or wash off any products. You simply place the Powerlite MASQ+ over your face. Lean back and enjoy! 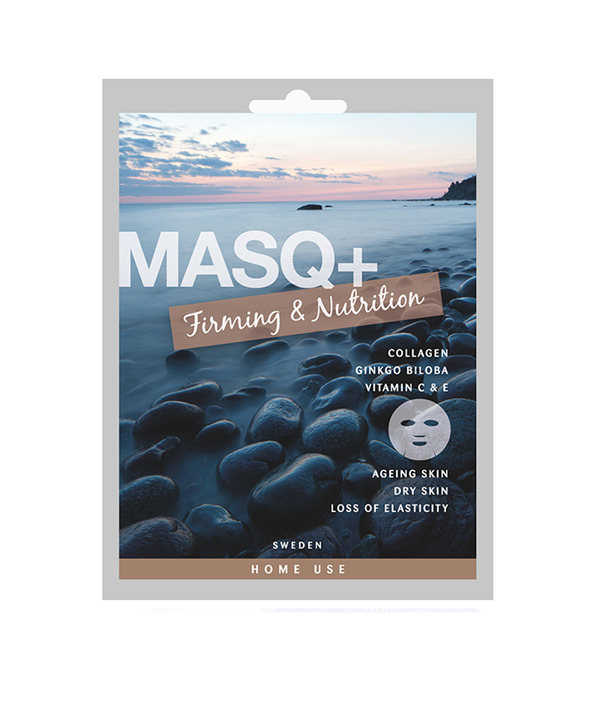 Powerlite MASQ+ Firming & Nutrition is packed with active ingredients, including moisturising collagen, ginkgo biloba, which improves blood circulation, and vitamins C and E, which are antioxidants. Regular use of Powerlite MASQ+, two or three times a week, will keep your skin hydrated, give it a healthy glow and help slow the aging process. Ingredients: aqua, glycerin, propylene glycol, butylene glycol, centella asiatica, chrysantellum indicum, morus alba bark, ginkgo biloba, hamamelis virginiana (witch hazel), peg-60 hydrogenated castor oil, arginine, carbomer, panax ginseng root, natto gum, wheat amino acids, sodium hyaluronate, betaine, niacinamide, hydrolyzed collagen, sodium PCA, allantoin, disodium EDTA, carrageenan, adenosine, caprylhydroxamic acid, 1,2-hexanediol, boswellia serrata, amylodextrin, calcium pantothenate, maltodextrin, sodium ascorbyl phosphate, pyridoxine HCL, tocopheryl acetate, silica, dipotassium glycyrrhizate, citrus grandis (grapefruit) oil.